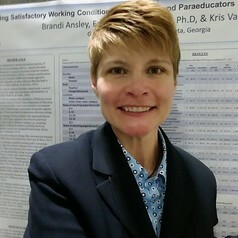 Brandi Ansley is currently an Assistant Professor of Special Education at Central Michigan University. Her professional interests surround school personnel wellness, working conditions, and school climate. She is the primary author of "Optimizing Special Educator Wellness and Job Performance Through Stress Management," and a contributing author of "Supporting Students by Maintaining Professional Well-Being in High-Stress Jobs." Previously, Brandi served as a Graduate Research Assistant for the Center for Research on School Safety, School Climate, and Classroom Management at Georgia State University. She has facilitated numerous professional development workshops to local and national audiences that include K-12 faculty and staff, university faculty, and other education professionals. Before transitioning to roles in higher education, Brandi's previous experience includes eight years as a special education teacher in high-need settings and three years as a community-based mental wellness facilitator.